There are charts for students to fill in which ask five questions under each category. The "how" questions address class rules such as "How do you get the teacher's attention? Students may fill in the information independently or they may interview each other. A culminating activity for older students might be to write an article about the classmate that they interviewed. Charts are large (one page each) and easy to write on. Font is clear and easy to read. 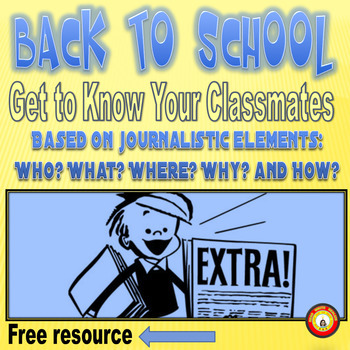 This activity might also be used to introduce journalism. FOLLOW O SOME GREAT STUFF!